Carousel is perhaps one of the most popular and exciting attractions for children. Well, what Playground is complete without a carousel? If for some reason it is still there, this ride can be done by hand. On its manufacturing time will take no more than three days. 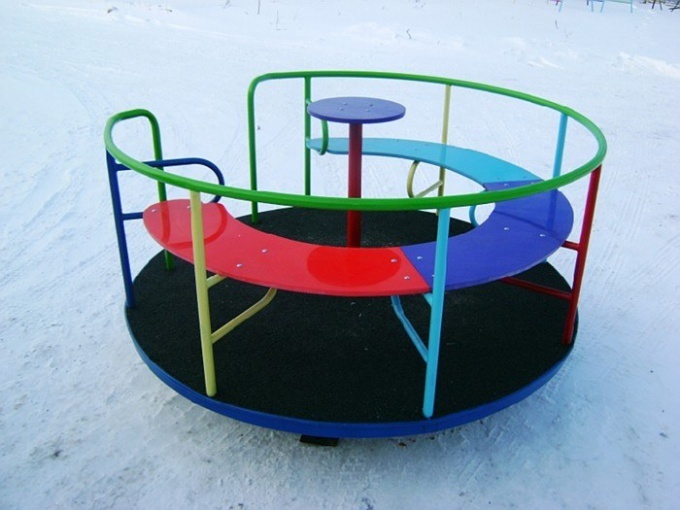 The main parts for the manufacture of the carousel are: metal bar approximately 1.5 meters in length, cylindrical ball bearing, four pipe frame, waterproof plywood as a base. Since the Foundation of the whole structure are the metal parts, then the employees must be treated very carefully. Because their quality depends on the health and safety of children. If the metal has rust, then these areas need to be sanded and painted. The main part of the carousel is a metal rod. Wall pipe must be a minimum thickness of three millimeters. When the place where will be located the future of the carousel is defined, it is necessary to mark the center of the design. At this point, you need to dig a hole with a depth of one meter and a width of 20 centimeters larger than the diameter of the main shaft. The metal pin must be vertically positioned into the excavated hole and concreted. The concrete hardens in about three days. No need to rush, because only when is well frozen concrete, the design of the carousel will stay still and steady. Further the metal rod need to wear a cylindrical bearing so that the walls of both parts in contact very tightly with each other. This is to ensure that the mechanism was moving smoothly. When developing the design of the carousel, you must consider the effort to start the rotation mechanism. Below the carousel is easy to operate, the rotation unit should be as inert. Usually the first time, even with very accurate calculations, a merry go hard, but upon further use and periodic lubrication of the rotation mechanism to spin the carousel will be able even by young children. When the basis for carousel ready, to the bearing you want to weld four pipes (in the form of crosspieces). Tubes bonded to each other with corners or pipe-wrap. Firmly bonded pipe will ensure the rigidity of the carousel. As grounds for the received frame suitable waterproof plywood. At the final stage, it only remains to weld the corners or pipe that will be attached to the seat. As a rule, the seats are made of wood, these are attached to the back and edges. In addition, for the safety of children while riding on the carousel, the seats need to attach protecting from drops chain. Carousel with his hands ready, it remains only to paint it in bright juicy colors.